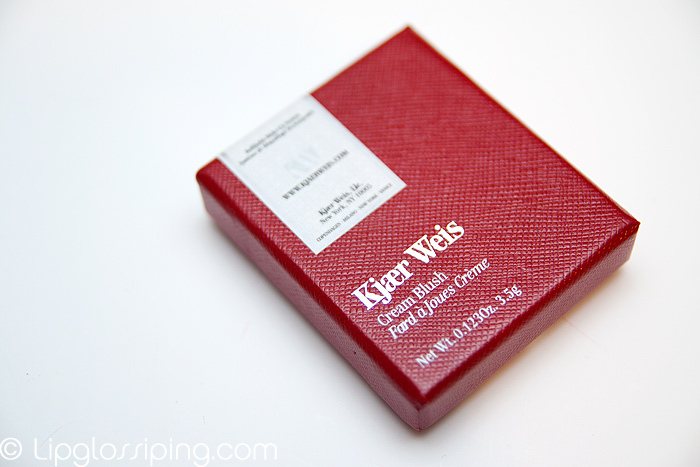 In a childish act of defiance (a.k.a: sticking two fingers up) at what has become my horribly dry skin… I went and bought this Kjaer Weis Creme Blush in Sun Touched. Created by New York-based makeup artist Kirsten Kjaer Weis, this edited collection pulls off the near impossible: It fuses the very best in organic ingredients with gorgeous textures and chic, always-flattering shades. And as a veteran of the magazine world, it’s no surprise that Kirsten sheathed her products in luxe, eye-catching compacts. Eye-catching? Definitely! Also eye-watering at £39 for a 3.5g blush. 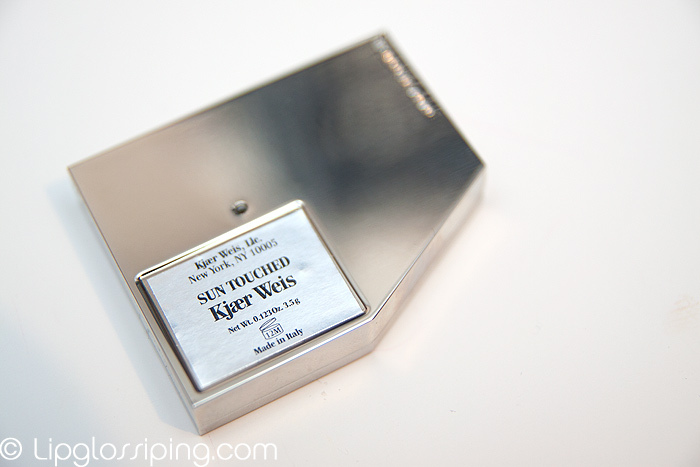 The heavyweight compacts are cast in a white bronze metal called zamac and monogrammed in white enamel. They’re beautiful and unlike some other highly elaborate products (I’m looking at you Guerlain Rouge G), these are purposefully manufactured to be kept and re-filled once you hit pan. I picked up the shade Sun Touched as I was looking for something neutral that would complement most other shades and be something that I could wear everyday. Well, you would at that price wouldn’t you? Sun Touched is a warm neutral, as the name might suggest. 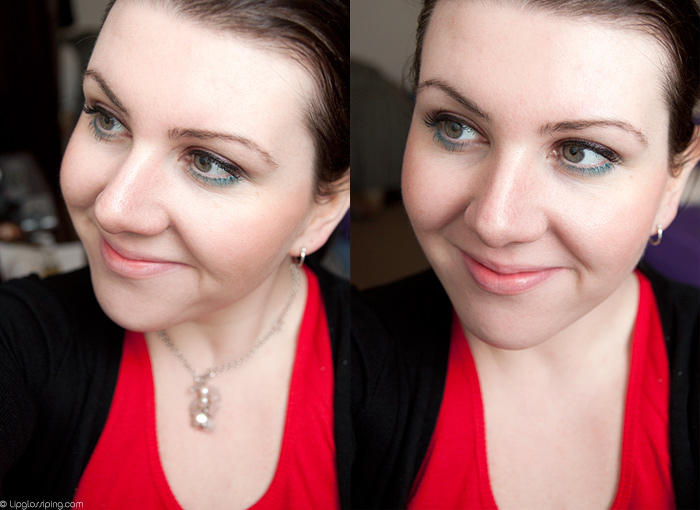 I’m pleased with my choice although it’s definitely warm enough to work better with other similarly toned shades. A clean and organic cream blush that adds a fresh glow, brightening the eyes and to create a youthful sun-kissed look. Applied to the apples of the cheeks, this hydrating, soft formula gently melts with the warmth of the fingers. 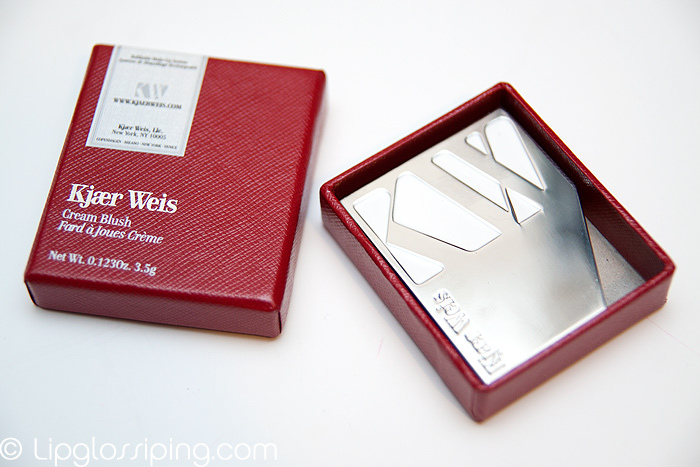 Kjaer Weis products are made with natural ingredients, using rose, honey suckle and gardenia as preservatives. Creme Blush is gently scented with Vanilla from Madagascar. 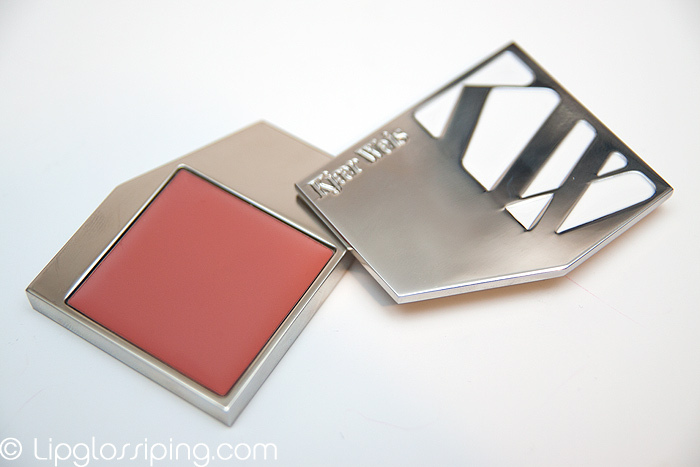 The texture is slightly tacky, feeling more like a gloss than a cream blush. I’ve been applying with my fingertips and blending softly without the use of a brush. Once on, the tackiness remains for a little while before fading. These don’t dry to a powder finish which means that I achieve a far dewier effect. Precisely what I wanted! The blush has a delicate sheen without being glossy and is devoid of all types of sparkle! I’d recommend this completely if you have dry or mature skin. On me, it lasts the course of the day without too much fading… the picture below was taken at the end of the day (hence no lipstick!). Refills are priced at a reasonable £18 each if you can stomach the initial outlay and Kjaer Weis products are available exclusively to Space NK both in the UK and USA. As the owner of some rather mature and very dry skin am a big fan of cream blush. Not sure that I am £39 worth of fan though when the MAC cream blush is about half that and does a terrific job. Does look purdy tho! This is gorgeous! I am about the same skintone as you so I am always interested in products you try out that look good on you, and I love cream blushes. Do you think that the refill pan would fit into any other existing cosmetic packaging? I’m tempted to just buy a refill since I am also tired of expensive packaging (especially when not refillable, like the Guerlain Rouge G’s you mention, to which I also give the hairy eyeball). I love the packaging so much – ultra slick! The colour doesn’t seem that exciting though, but you’re probably buying more into the brand than anything else. So pretty. It makes you glow! Love the packaging! Looks beautiful on you too, a really subtle, healthy glow. Back on topic… I adore the packaging! 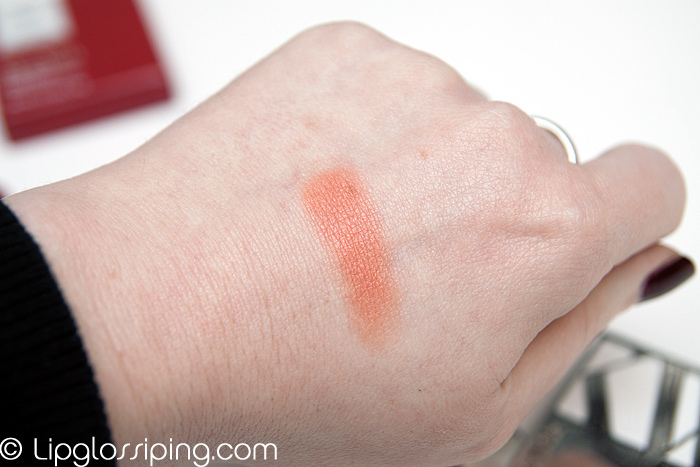 Looking at the swatch I thought it looked too orange, but when applied to your face it looks just glowy and perfect. Curse you. I’ve had a low level itch for one of these for a while, and you’ve just reawakened it. Beautiful,wheres another SpaceNK 20% off event when you need one 😉 I will have to get one of these, thanks for the review and lovely pictures. Very nice shade!!! I am hearing the brand name for the first time!!! Recently posted: My Nail Art 15!! Did you win my Sun Ain’t Gonna Shine Anymore Giveaway? !